Death is a Shaman’s main ally. Death puts her whole life and purpose in perspective. Death is the urging force behind her every step. She respects Death, but she is not afraid of Death. She is friends with Death. She invites Death to her home, she celebrates Death, she pokes fun at Death. So do the people of Mexico who bravely invite death to their homes to join in the beautiful Dia de Los Muertos celebration year after year. 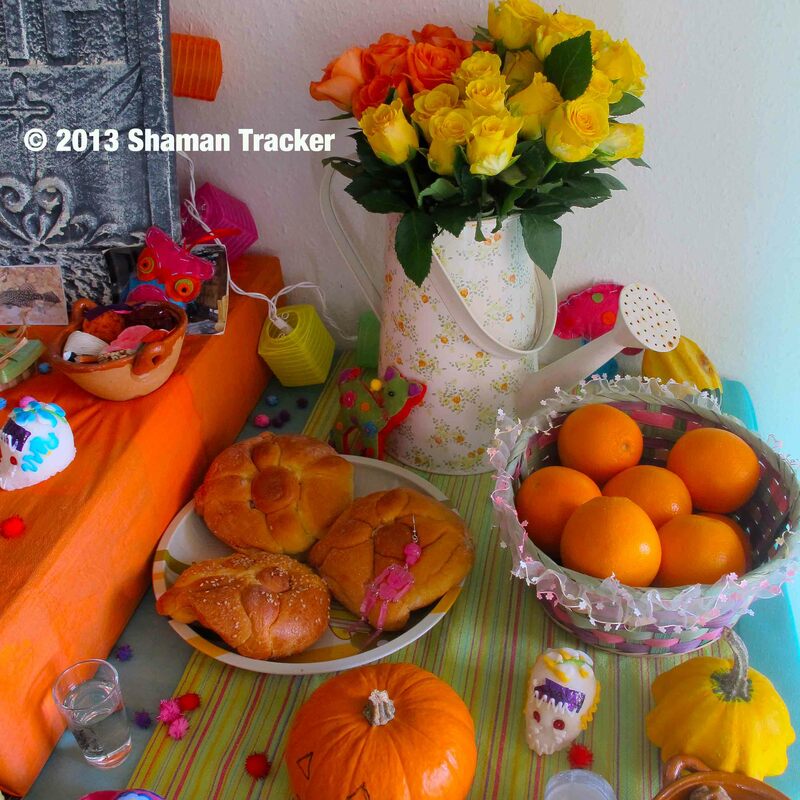 They build very colorful and lively altars to honor and celebrate dear ones who have passed away. Death haunts us in the Western society, the society of time starved immortals who prefer to ignore the very existence of death. To us death is a taboo. We know of only one time, the linear time, in which the past is always behind us and the future always ahead of us…. We do not know death, to us death est un inconnu. To us, death has no face. 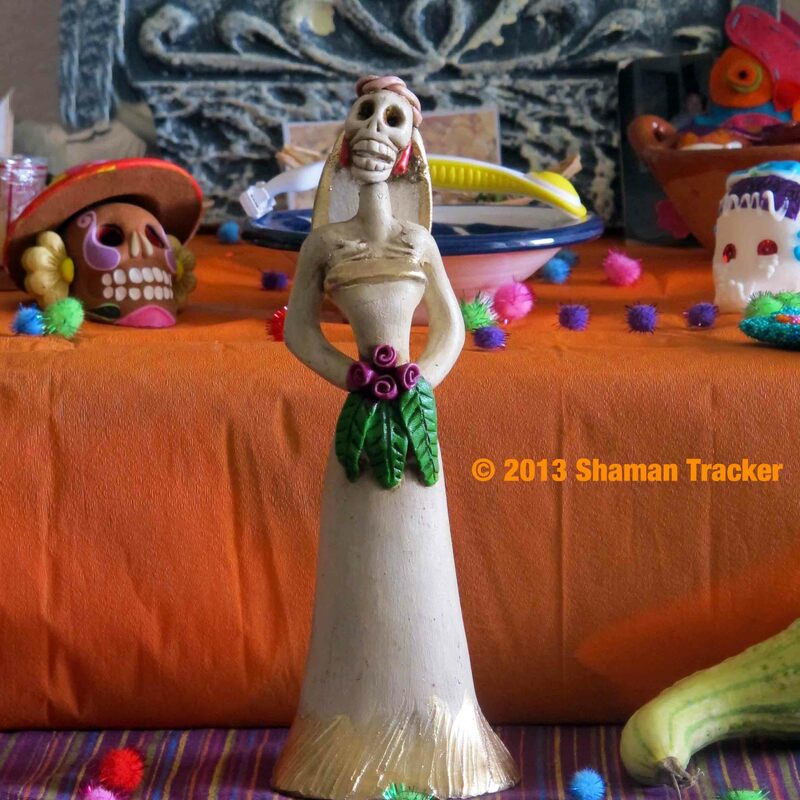 On the contrary in Mexico, death is an ultimate experience of life, that’s made to seem very approachable. For Mexicans, death does not only have a face, it’s a ‘she’. She evolved from the Aztec goddess Mictecacihuatl, the guardian of the underworld, to the modern “lady of the dead” La Catrina. An elegantly dressed female skeleton wearing an extravagantly plumed hat, she is a caricature of high society reminding us that we are all equal in the face of death. Mexican Dia de Muertos altars are very elaborate and full of symbols. They can be made from two, three or seven levels. Levels represent the division between the Earth and skies, the underworld, and the levels that a soul must traverse before reaching heaven. Food is at the center of every altar. Pan de muerto, “bread of dead”, symbolizes the circle of life and union with the dead. Every altar is filled with the offerings ‘ofrendas’ for the deceased, including their favorite food, drinks, cigarettes, chocolate, candy and other items they enjoyed. 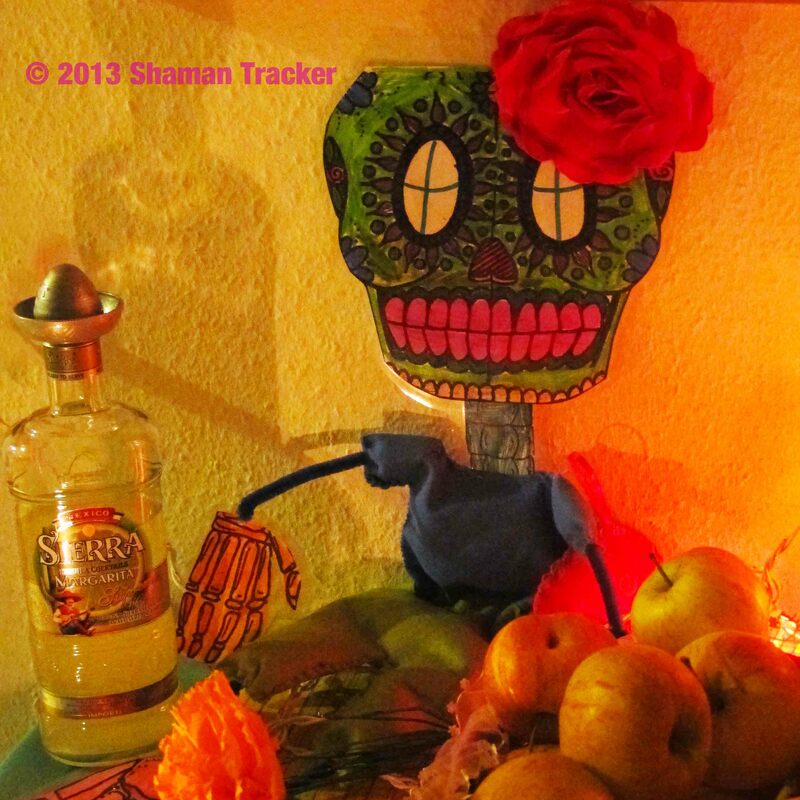 Sugar skulls “calaveras”, are representations of the deceased friends and relatives. Eaten by children after the festivities, they are a symbol of the Mexicans’ ability to play with and poke fun at death. Candles, lanterns and orange and yellow flowers are placed on altars to guide the souls of the deceased. Salt and incense ward off the uninvited spirits. At the cemeteries, the living and the souls of the departed feast together, music is played and dances are made to honor the spirits. In 2003 UNESCO distinguished this Indigenous festivity dedicated to the dead as a Masterpiece of Oral and Intangible Heritage of Humanity. This entry was posted in children, connecting, conservation, last journey, planet, quote, shamanism, spirit, time and tagged ancestors, chasing time, children, dance, death, Dia de Los Muertos, earth, existence, fear, fun, future, La Catrina, life, past, plants, spirit, spiritual journey, spirituality, time, timeless. Bookmark the permalink. I personal have no fear of death or dying, I never have. However, it fascinates me how when the topic of death breaks into a conversation, smiles drop, eye contact is broken, and feet are shuffled showing great discomfort. I agree with you, that death gives purpose to our lives and that it should be, openly acknowledged and accepted, for death surrounds us on every level, and in every moment of our existence. Some people have labelled me odd and even strange for my blatant openness on the subject of death, but for me it is the reverse, not to embrace death is odd for by not doing so we fail to embrace the gift of life. One of the most difficult exercises while studying shamanism were around death. But once we understand that we are constantly dying little deaths in this life time, the ‘death’ seems less big and less scary. Many would say that that’s a very sinister saying, yet death is part of life. When I make a place for it in my life, I feel like I live more fully and appreciate small everyday things more.